The small village of Ganna lies on highway 83 just before Pápá and is surrounded by the Bakonya Forest. In 1701, Ganna was first mentioned as a settlement; in 1754, the village was already recorded with its two parts Small Ganna and Greater Ganna. The earliest record of the village as a united property is from 1756. There are no detailed descriptions of the historical village left. What is known of Greater Ganna is that Ferenc Esterházy settled families from Bavaria and Styria by the name of Hospes on the southern shore of Bitva-river in 1748. Furthermore, Croatian and possibly also Wends came to the village. This can be assumed by the local dialectal words of “krowon” and “krobati”, which described the inhabitants. The settlers mostly came from the former western border of the country. In Small Ganna, eight families from Baden were settled on Mai 25th 1752. 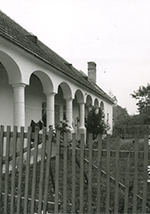 In all villages that belonged to Esterházy, the three-field system was established. This modern form of agriculture was prescribed to the inhabitants. Today, 80% of the approximately 300 inhabitants avow themselves to German nationality and the Roman-Catholic Church. The neo-classicist parish church with its mausoleum was designed by the French architect Charles Moreau and built between 1808 and 1818. 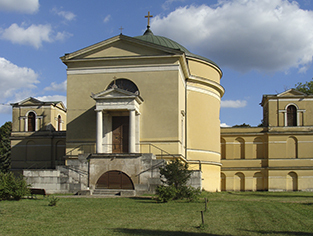 It was consecrated to Saint Anne and built in the style of both the Roman Pantheon and the mausoleum of the Esterházy family. The church’s layout forms a Greek-style cross. The church has a large dome, which was the largest one in the whole of the country at the time of its construction. 21 stairs lead towards its colonnade. The main altar is made of marble and bears a statue of the Virgin Mary. The reliefs and statues of saints were made by the Viennese sculptor Josef Klieber. The pieta was a gift of Countess Polixena Lobkowitz. In the lower church, a crypt of the Esterházy family can be found. 54 members of the family are buried in bronze and marble sarcophagi. Amongst them are Miksa Esterházy (died 1883), the founder of Hungarian Sports Club and Báltin Esterházy, ambassador in Moscow. The Ganna Women’s Choir maintains local traditions. The choir is accompanied by József Schlecht on the accordeion. In 2011, the choir was awarded the prize “PRO CULTURA MINERITATUM HUNGARIAE”. The neo-classicist parish church and mausoleum in Ganna. LEFT: Typical covered passageway of Swabian homes. 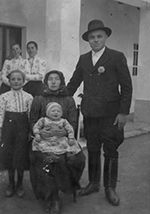 RIGHT: Swabian family in Ganna, 1937. 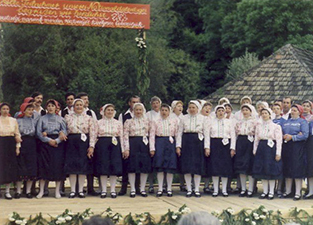 Ganna Women’s Choir around 1980.